"The Lion" will be landing. And at New York's JFK Airport, an elite American task force waits as the notorious Libyan terrorist prepares to defect to the West. 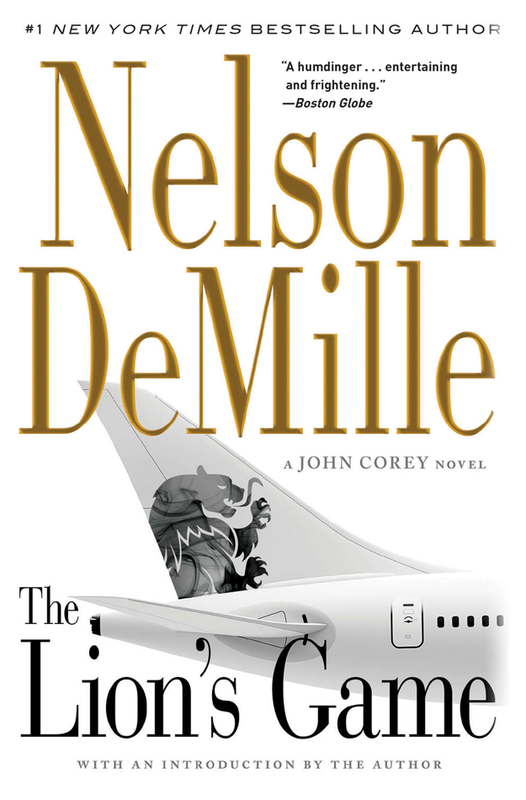 Then, aboard Flight 175, something goes eerily, horribly wrong - a mere prelude to the terror that is to come. Ex-NYPD cop, now Task Force contract agent John Corey - together with his formidable and beautiful new partner, Kate Mayfield - will follow a trail of smoke and blood across the country. His quarry: a foe with the cunning of a lion and all the bloodlust of a man. To win a desperate game with no rules at all, Corey must invent a strategy that leaves room for no luck at all. You'd think that anyone who'd been shot three times and almost become an organ donor would try to avoid dangerous situations in the future. But, no, I must have this unconscious wish to take myself out of the gene pool or something. It was a nice spring day, a Saturday, moderate traffic on the Shore Parkway, sometimes known as the Belt Parkway, and recently renamed POW/MIA Parkway to avoid confusion. It was late afternoon, and seagulls from a nearby landfill--formerly known as a garbage dump--were crapping on the taxi's windshield. I love spring. I wasn't headed off on vacation or anything like that--I was reporting for work with the aforementioned Anti-Terrorist Task Force. This is an organization that not too many people know about, which is just as well. The ATTF is divided into sections which focus on specific bunches of troublemakers and bomb chuckers, like the Irish Republican Army, Puerto Rican Independence Movement, black radicals, and other groups that will go unnamed. I'm in the Mideastern section, which is the biggest group and maybe the most important, though to be honest, I don't know much about Mideastern terrorists. But I was supposed to be learning on the job. So, to practice my skills, I started up a conversation with the Pakistani guy whose name was Fasid, and who for all I know is a terrorist, though he looked and talked like an okay guy. I asked him, "What was that place you came from?" "Really? How long have you been here?" "Well, my ex-brother-in-law, Gary, for one. He's always badmouthing America. Wants to move to New Zealand." "I have an uncle in New Zealand." "No kidding? Anybody left in Islamabad?" He laughed, then asked me, "You meeting somebody at the airport?" "So, you're meeting somebody? I could hang around and take you back to the city." Fasid's English was pretty good--slang, idioms, and all that. I replied, "I have a ride back." "You sure? I could hang around." Actually, I was meeting an alleged terrorist who'd surrendered himself to the U.S. Embassy in Paris, but I didn't think that was information I needed to share with Fasid. I said, "You a Yankee fan?" "Not anymore." Whereupon he launched into a tirade against Steinbrenner, Yankee Stadium, the price of tickets, the salaries of the players, and so forth. These terrorists are clever, sounding just like loyal citizens. Anyway, I tuned the guy out and thought about how I'd wound up here. As I indicated, I was a homicide detective, one of New York's Finest, if I do say so. A year ago this month, I was playing dodge-the-bullets with two Hispanic gentlemen up on West 102nd Street in what was probably a case of mistaken identity, or sport shooting, since there seemed to be no reason for the attempted whack. Life is funny sometimes. Anyway, the perps were still at large, though I had my eye out for them, as you might imagine. After my near-death experience and upon release from the hospital, I accepted my Uncle Harry's offer to stay at his summer house on Long Island to convalesce. The house is located about a hundred road miles from West 102nd Street, which was fine. Anyway, while I was out there, I got involved with this double murder of a husband and wife, fell in love twice, almost got killed. Also, one of the women I fell in love with, Beth Penrose by name, is still sort of in my life. While all this was going on out on eastern Long Island, my divorce became final. And as if I wasn't already having a bad R&R at the beach, I wound up making the professional acquaintance of a schmuck on the double homicide case named Ted Nash of the Central Intelligence Agency who I took a big dislike to, and who hated my guts in return, and who, lo and behold, was now part of my ATTF team. It's a small world, but not that small, and I don't believe in coincidence. There was also another guy involved with that case, George Foster, and FBI agent, who was okay, but not my cup of tea either. In any case, it turns out that this double homicide was not a Federal case, and Nash and Foster disappeared, only to reappear in my life about four weeks ago when I got assigned to this ATTF Mideastern team. But no sweat, I've put in for a transfer to the ATTF's Irish Republican Army section, which I will probably get. I don't have any real feelings about the IRA either way, but at least the IRA babes are easy to look at, the guys are more fun than your average Arab terrorist, and the Irish pubs are primo. I could do some real good in the anti-IRA section. Really. Anyway, after all this mess out on Long Island, I get offered this great choice of being hauled in front of the NYPD disciplinary board for moonlighting or whatever, or taking a three-quarter medical disability and going away. So I took the medical, but also negotiated a job at John Jay College of Criminal Justice in Manhattan where I live. Before I got shot, I'd taught a class at John Jay as an Adjunct Professor, so I wasn't asking for much and I got it. Starting in January, I was teaching two night classes at JJ and one day class, and I was getting bored out of my mind, so my ex-partner, Dom Fanelli, knows about this Special Contract Agent program with the Feds where they hire former law enforcement types to work with ATTF. I apply, I'm accepted, probably for all the wrong reasons, and here I am. The pay's good, the perks are okay, and the Federal types are mostly schmucks. I have this problem with Feds, like most cops do, and not even sensitivity training would help. But the work seems interesting. The ATTF is a unique and, I may say, elite group (despite the schmucks) that only exists in New York City and environs. It's made up mostly of NYPD detectives who are great guys, FBI, and some quasi-civilian guys like me hired to round out the team, so to speak. Also, on some teams, when needed, are CIA prima donnas, and also some DEA--Drug Enforcement Agency people who know their business, and know about connections between the drug trade and the terrorist world. Other team players include people from the Bureau of Alcohol, Tobacco and Firearms of Waco, Texas, fame, plus cops from surrounding suburban counties, and New York State Police. There are other Federal types from agencies I can't mention, and last but not least, we have a few Port Authority detectives assigned to some teams. These PA guys are helpful at airports, bus terminals, train stations, docks, some bridges and tunnels under their control, and other places, like the World Trade Center, where their little empire extends. We have it all pretty much covered, but even if we didn't, it sounds really impressive. The ATTF was one of the main investigating groups in the World Trade Center bombing and the TWA 800 explosion off Long Island. But sometimes we take the show on the road. For instance, we also sent a team to help out with the African embassy bombings, though the name ATTF was hardly mentioned in the news, which is how they like it. All of this was before my time, and things have been quiet since I've been here, which is how I like it. The reason the almighty Feds decided to team up with the NYPD and form the ATTF, by the way, is that most FBI people are not from New York and don't know a pastrami sandwich from the Lexington Avenue subway. The CIA guys are a little slicker and talk about cafés in Prague and the night train to Istanbul and all that crap, but New York is not their favorite place to be. The NYPD has street smarts, and that's what you need to keep track of Abdul Salami-Salami and Paddy O'Bad and Pedro Viva Puerto Rico and so on. Your average Fed is Wendell Wasp from West Wheatfield, Iowa, whereas the NYPD has mucho Hispanics, lots of blacks, a million Irish, and even a few Muslims now, so you get this cultural diversity on the force that is not only politically cool and correct, but actually useful and effective. And when the ATTF can't steal active-duty NYPD people, they hire ex-NYPD like me. Despite my so-called disability, I'm armed, dangerous, and nasty. So there it is. We were approaching JFK, and I said to Fasid, "So, what did you do for Easter?" "Easter? I don't celebrate Easter. I'm Muslim." See how clever I am? The Feds would've sweated this guy for an hour to make him admit he was a Muslim. I got it out of him in two seconds. Just kidding. But, you know, I really have to get out of the Mideast section and into the IRA bunch. I'm part Irish and part English, and I could work both sides of that street. Fasid exited the Shore-Belt-POW/MIA Parkway and got on the Van Wyck Expressway heading south into JFK. These huge planes were sort of floating overhead making whining noises, and Fasid called out to me, "Where you going?" "Yeah. There's twenty, thirty, forty--"
Fasid shrugged, just like an Israeli cabbie. I was starting to think that maybe he was a Mossad agent posing as a Pakistani. Or maybe this job was getting to me. There's all these colored and numbered signs along the expressway, and I let the guy go to the International Arrivals, a huge structure with all the airline logos, one after the other out front, and he asked again, "Which airline?" "I don't like any of these. Keep going." I directed him onto another road, and we were now going to the other side of the big airport. This is good trade craft, to see if anybody's following you. I learned this in some spy novel or maybe a James Bond movie. I was trying to get into this anti-terrorist thing. I got Fasid pointed in the right direction and told him to stop in front of a big office-type building on the west side of JFK that was used for this and that. This whole area is full of nondescript airport services buildings and warehouses, and no one notices anybody's comings and goings, plus the parking is easy. I paid the guy, tipped him, and asked for a receipt in the exact amount. Honesty is one of my few faults. Fasid gave me a bunch of blank receipts and asked again, "You want me to hang around?" I went into the lobby of the building, a 1960s sort of crap modern architecture, and instead of an armed guard with an Uzi like they have all over the world, there's just a sign that says RESTRICTED AREA--AUTHORIZED PERSONNEL ONLY. So, assuming you read English, you know if you're welcome or not. I went up a staircase and down a long corridor or gray steel doors, some marked, some numbered, some neither. At the end of the corridor was a door with a nice blue-and-white sign that said CONQUISTADOR CLUB--PRIVATE--MEMBERS ONLY. There was this electronic keycard scanner alongside the door, but like everything else about the Conquistador Club, it was a phony. What I had to do was to press my right thumb on the translucent face of the scanner, which I did. About two seconds later, the metrobiotic genie said to itself, "Hey, that's John Corey's thumb--let's open the door for John." And did the door swing open? No, it slid into the wall as far as its dummy doorknob. Do I need this nonsense? Also there's a video scanner overhead, in case your thumbprint got screwed up with a chocolate bar or something, and if they recognize your face, they also open the door, though in my case they might make an exception. So I went in, and the door slid closed automatically behind me. I was now in what appeared to be the reception area of an airline travelers' club. Why there'd be such a club in a building that's not near a passenger terminal is, you can be sure, a question I'd asked, and I'm still waiting for an answer. But I know the answer, which is that when the CIA culture is present, you get this kind of smoke-and-mirrors silliness. These clowns waste time and money on stagecraft, just like in the old days when they were trying to impress the KGB. What the door needed was a simple sign that said KEEP OUT. Anyway, behind the counter was Nancy Tate, the receptionist, a sort of Miss Moneypenny, the model of efficiency and repressed sexuality, and all that. She liked me for some reason and greeted me cheerily, "Good afternoon, Mr. Corey." "I was delayed by traffic." "Actually, you're ten minutes early." "I took it off a dead Bulgarian on the night train to Istanbul." Anyway, the reception area was all leather and burled wood, plush blue carpet, and so forth, and on the wall directly behind Nancy was another logo of the fictitious Conquistador Club. And for all I knew, Ms. Tate was a hologram. To the left of Ms. Tate was an entranceway marked CONFERENCE AND BUSINESS AREA that actually led to the interrogation rooms and holding cells, which I guess could be called the Conference and Business Area. To the right, a sign announced LOUNGE AND BAR. I should be so lucky. That was in fact the way to the communications and operations center. Ms. Tate said to me, "Ops Center. There are five people including yourself." "Thanks." I walked through the doorway, down a short hallway, and into a dim, cavernous, and windowless room that held desks, computer consoles, cubicles, and such. On the big rear wall was a huge, computer-generated color map of the world that could be programmed to a detailed map of whatever you needed, like downtown Islamabad. Typical of most Federal facilities, this place had all the bells and whistles. Money is no problem in Fedland. In any case, this facility wasn't my actual workplace, which is in the aforementioned 26 Federal Plaza in lower Manhattan. But this was where I had to be on this Saturday afternoon to meet and greet some Arab guy who was switching sides and needed to be taken safely downtown for a few years of debriefing. I kind of ignored my teammates and made for the coffee bar, which, unlike the one in my old detective squad room, is neat, clean, and well stocked, compliments of the Federal taxpayers. I fooled around with the coffee awhile, which was my way of avoiding my colleagues for a few more minutes. I got the coffee the right color and noticed a tray of donuts that said NYPD and a tray of croissants and brioche that said CIA and a tray of oatmeal cookies that said FBI. Someone had a sense of humor. Anyway, the coffee bar was on the operations side of the big room and the commo side was sort of elevated on a low platform. A lady duty agent was up there monitoring all the gidgets and gadgets. My team, on the operations side, was sitting around somebody's empty desk, engaged in conversation. The team consisted of the aforementioned Ted Nash of the CIA and George Foster of the FBI, plus Nick Monti of the NYPD, and Kate Mayfield of the FBI. WASP, WASP, Wop, WASP. Kate Mayfield came to the coffee bar and began making herself tea. She is supposed to be my mentor, whatever that means. As long as it doesn't mean partner. She said to me, "I like that tie." "I once strangled a Ninja warrior to death with it. It's my favorite." "Really? Hey, how are you getting along here?" "Well, it's too soon for me to tell you. You tell me why you put in for the IRA section." "Well, the Muslims don't drink, I can't spell their f-ing names on my reports, and the women can't be seduced." "That's the most racist, sexist remark I've heard in years." "You don't get around much." "This is not the NYPD, Mr. Corey." "No, but I'm NYPD. Get used to it." "Are we through attempting to shock and appall?" "Yeah. Look, Kate, I thank you for your meddling--I mean mentoring--but in about a week, I'll be in the IRA section or off the job." I looked at her as she messed around with a lemon. She was about thirty, I guess, blond, blue eyes, fair skin, athletic kind of build, perfect pearly whites, no jewelry, light makeup, and so on. Wendy Wasp from Wichita. She had not one flaw that I could see, not even a zit on her face or a fleck of dandruff on her dark blue blazer. In fact, she looked like she'd been airbrushed. She probably played three sports in high school, took cold showers, belonged to 4-H, and organized pep rallies in college. I hated her. Well, not really, but about the only thing we had in common was some internal organs, and not even all of those. Also, her accent was hard to identify, and I remembered that Nick Monti said her father was an FBI guy, and they'd lived in different places around the country. She turned and looked at me, and I looked at her. She had these piercing eyes, the color of blue dye No. 2, like they used in ice pops. She said to me, "You came to us highly recommended." "Whom. By some of your old colleagues in Homicide." "Also," she said, "by Ted and George." She nodded toward Schmuck and Putz. I almost choked on my coffee. Why these two guys would say anything nice about me was a total mystery. "They aren't fond of you, but you impressed them on that Plum Island case." "Yeah, I even impressed myself on that one." "Why don't you give the Mideast section a try?" She added, "If Ted and George are the problem, we can switch you to another team within the section." "I love Ted and George, but I really have my heart set on the anti-IRA section." "Too bad. This is where the real action is. This is a career builder." She added, "The IRA are pretty quiet and well behaved in this country." "Good. I don't need a new career anyway." "The Palestinians and the Islamic groups, on the other hand, are potentially dangerous to national security." "No 'potentially' about it," I replied. "World Trade Center." I'd come to discover that these three words in the ATTF were like, "Remember Pearl Harbor." The intelligence community got caught with their pants down on that one, but came back and solved the case, so it was a draw. She continued, "The whole country is paranoid about a Mideast terrorist biological attack or a nuclear or chemical attack. You saw that on the Plum Island case. Right?" "So? Everything else in the ATTF is a backwater. The real action is in the Mideast section, and you look like a man of action." She smiled. I smiled in return. I asked her, "What's it to you?" "I like New York Neanderthals." "Will do." I glanced at a TV monitor close by and saw that the flight we were waiting for, Trans-Continental 175 from Paris, was inbound and on time. I asked Ms. Mayfield, "How long do you think this will take?" "Maybe two or three hours. An hour of paperwork here, then back to Federal Plaza, with our alleged defector, then we'll see." "Are you in a rush to get somewhere?" "I feel badly that national security is interfering with your social life." I didn't have a good reply to that, so I said, "I'm a big fan of national security. I'm yours until six P.M."
"You can leave whenever you want." She took her tea and rejoined our colleagues. So, I stood with my coffee, and considered the offer to take a hike. In retrospect, I was like the guy standing in quicksand, watching it cover my shoes, curious to see how long it would take to reach my socks, knowing I could leave anytime soon. Unfortunately, the next time I glanced down, it was up to my knees.